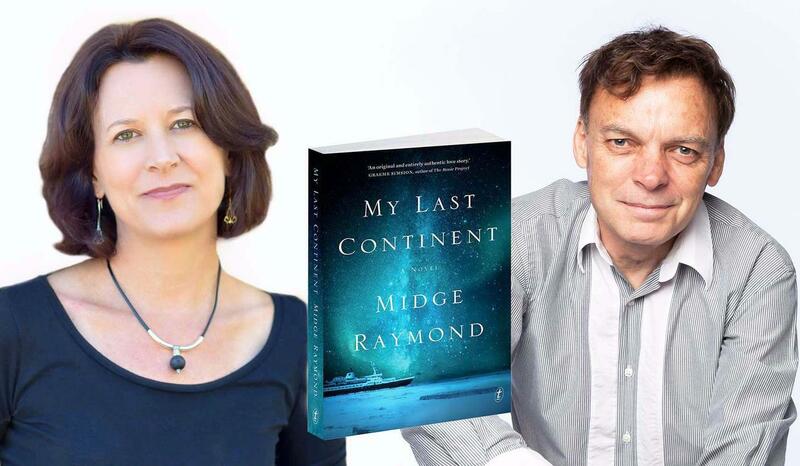 My Last Continent by Midge Raymond is an unforgettable novel of love and loss, set against the dramatic landscape of Antarctica. Graeme Simsion, author of The Rosie Project and The Rosie Effect, described it as ‘an original and entirely authentic love story...It recognises that love is seldom simple or exclusive, and that the things that bring us together can also keep us apart.’ He had the opportunity to ask Midge Raymond a few questions. What inspired My Last Continent? When I visited Antarctica more than a decade ago, two things in particular stuck with me. One was the concern of the shipboard naturalists about the larger cruise ships that were beginning to visit the region. We were on a small expedition ship of around one hundred passengers; ships carrying thousands of passengers were venturing farther and farther south, which was troubling to them because if something were to happen to one of those ships, rescuers could be days away—and, given the extreme weather conditions and the distance from hospitals, this is an incredible risk. So I began to wonder what a catastrophic shipwreck in this region would look like. The other thing that stuck with me was seeing a fellow passenger fall on the ice near a penguin colony. He was fine, fortunately, but seeing this happen reinforced the notion that, at the bottom of the world, you are at the mercy of the conditions and of the few people who are with you. And of course, Antarctica is inspiring in and of itself—there is absolutely nothing else like it on the planet: whitewashed, freezing, uninhabited by humans and filled with creatures that can’t be found anywhere else. For me, one of the strengths of the book is the way you juxtapose the harshness of Antarctica with the comfort and warmth that Deb and Keller find with each other. How did this love story come together? Did you always know how it would end, or did you discover it as you wrote? I did have a vague idea of how the novel would end, but I discovered the details through the writing process. The love story came together when I knew Deb could only end up with someone who loved the continent as much as she did. For her, the work and the penguins always came first—and Keller came to feel the same way. Both of them had been unlucky in love in the past, and I liked the idea of them finding home not only in Antarctica but in each other. Isolation is a recurrent theme in My Last Continent: the personal isolation that Deb and Keller experience, the isolation of penguins, Deb’s hope to isolate the human footprint on the continent...Is this a topic that’s important to you? I’m fascinated with the idea of isolation, particularly in these days of constant connectivity. I think it’s important for we humans to isolate ourselves occasionally—to have time to recharge, to be quiet and still—for me, being in nature is the most invigorating way to disengage. I’ve also discovered, in recent years, that I need to get away from my phone and especially my internet connection in order to write. I usually leave my house—sometimes just for a few hours, other times for days or weeks—and when I’m writing, I always take lots of walks outside to clear my brain and to hear myself think. And, as much as I enjoy exploring natural places, I also believe it’s especially important for wildlife to have territory that is free of human influence. Tourism isn’t nearly as disruptive as commercial enterprises—for example, whales are still illegally hunted in the Southern Ocean, and krill, which both penguins and whales depend on for survival, are being taken by the hundreds of thousands of tons a year. So we desperately need marine protected areas in the Antarctic in order to keep the ecosystem in balance. You write about two places you’ve visited/lived in real life: Antarctica and Oregon. How does place/landscape inform your fiction? For me, place is essential to character, and in fact, Antarctica became a character of sorts in the writing of this novel. For me, every setting, whether an American city or an icy continent, has a personality, and where a character is from—and where he or she lives now—is so vital to me in understanding that character. That Deb is from the Midwest says as much about her as the fact that she settled on the West Coast and spends as much time as she can at the bottom of the world. How did your work as a penguin researcher inform the novel? On a personal level, being part of a penguin census at the Punta Tombo colony deepened my respect for working scientists—the work they do is so important, and also so challenging. The scientists who have made penguin research their life’s work spend years, even decades, doing what I did for only a couple of weeks—crawling around looking into penguin burrows from dawn until sunset, weighing and measuring birds, taking showers only once a week with trucked-in water, and so much more: crunching data, publishing results, raising funds to continue everything they do. It was also interesting for me to see all this from my decidedly non-scientific background; the researchers I met care deeply about the penguins, but they are more emotionally detached than I am, in a normal way that I think is necessary to do good science. They’re used to seeing dead penguins, broken eggs and other things that are par for the course in a day in the field but that I found unbearably sad. And this informed Deb’s character quite a bit. She is unlike most scientists in that she cares for the birds on a level that probably isn’t healthy; she anthropomorphises them to an extent, and she is caught up in their fate not only scientifically but emotionally as well. You’ve written about a continent that is undergoing rapid change—if you were to write a follow-up to MLC set ten years in the future, would Antarctica look the same? I hope so. But I’m not sure. Right now scientists are forecasting that Antarctic ice melt could raise sea levels by three to ten feet by the end of this century—which could happen more slowly, or more rapidly, than predicted—and this would not only change Antarctica but the map of the entire world. It would certainly affect the penguins, seals, whales, krill and myriad other creatures who depend on sea ice. Tourism is also increasing, and I hope it’s managed well so that it doesn’t one day look like the Caribbean, with boats everywhere you look. Fortunately, organisations such as IAATO are working at managing tourism to protect the environment and the animals. If we as a society can make some serious global changes to combat climate change, if we create marine protected areas, and if we can limit tourism to small, educational expeditions, it’s my hope that Antarctica could look very much the same in ten years. And perhaps even beyond. Is there anything you particularly want readers to take away from the book? Most important, I hope readers enjoy the journey. But I also hope that they fall in love with Antarctica and its creatures, as I have. It may be hard for some readers to fall in love with a cold, icy place. Yet I love that, through this novel, I can introduce several species of penguins and show how incredible they are, which in turn may inspire people to take great care of our planet, since the birds’ future depends on it. My Last Continent is about rescuers—not only in terms of the shipwreck but because Deb and Keller’s work aims to save the penguins from the challenges they face. And we all have a role to play in saving the planet and its many vulnerable species. My Last Continent is available online and in bookshops now. Find more praise, book-club notes and an author video here. Graeme Simison’s new novel, The Best of Adam Sharp, will be released in September. This Q&A was arranged by Midge Raymond and Graeme Simsion’s US publisher, Simon & Schuster.